Home » The Law & You » I Have Limited Tort and Can’t Sue. Can Something Be Done? I Have Limited Tort and Can’t Sue. Can Something Be Done? After being rear-ended at a red light by a drunk driver, a viewer was told he couldn’t sue because of his limited tort policy. Can anything be done? Car accident lawyers Ed Ciarimboli and Harry McGrath Jr. explain his legal options. 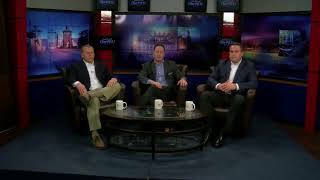 Dave Kuharchik: We have a scenario involving DUI for this edition of “The Law & You.” Back with us, attorneys Harry McGrath, who’s here for Greg, and Ed Ciarimboli. Good to see you guys. Ed: Taking over. The Uber, Lyft. Dave: Try to avoid getting in this situation. Harry McGrath: Taxis still work as well. Ed: Taxis. Good old fashion taxis still work as well. Dave: Didn’t go down so well for someone. Let’s talk about what happened here. Mario in West Pittston says, “I was rear ended at a red light and I have limited tort insurance and was told I can’t sue. The other driver was drunk and got charged with a DUI. This doesn’t seem fair.” So a couple of things here, Mario. There’s a DUI situation and there’s an insurance situation, how can you sort this out? Ed: So that’s not true. Even though you had limited tort, because the individual that hit you was under the influence of drugs or alcohol, you will be deemed full tort for purposes of the lawsuit against that individual. However, that does not apply to your own insurance which is called under insured motorist coverage. You still will be limited tort for your UIM case because that exclusion does not apply. You are then going to have to then prove that you’ve sustained a serious bodily impairment. I’m going to let Harry tell you what you’re going to need to do to make sure you can pursue this claim but that’s kind of the basics of it. Harry: That’s right. At the outside of course you need to let your insurance company know because despite the fact that it sounds like you have a solid exception to the limited tort bar of recovery. That doesn’t mean you’re not going to have a hard time getting over it. You need to get to an attorney, you need to get to your doctor, you need to make sure you’re following up if you’re having any types of problems. They’re going to say you didn’t have a serious bodily injury. In order to show that you did, you need to be in a doctor’s office, you need to have real healthcare providers say that this is a significant injury. Ed: Absolutely. Well done, well done. Dave: Good advice. If you need the advice of the attorneys you can give them a call or check them out online. Don’t forget, results matter with attorneys Harry McGrath and Ed Ciarimboli. Thanks for being here. Ed and Harry: Thank you.